Saturday was like a 10 AM wakeup. We were all exhausted from the night before and we didn't need to be anywhere until 3 PM. Some of us went to get Starbucks and pizza, others stayed sleeping. We are old ladies, people! 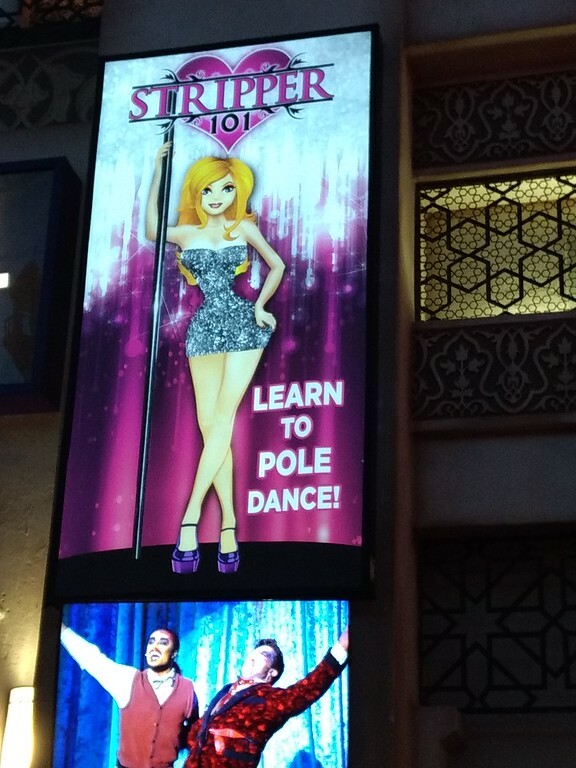 At 2:30 we left to walk to Planet Hollywood for our Stripper 101 class. This class was AWESOME! I loved it. We learned how to do a strip tease/lap dance plus we worked the pole. So fun. Our instructor was an ex-stripper in LA and Vegas and she showed us some moves and even taught us how to hustle for more $$. We were clearly there as a joke class, but she made it interesting and gave us useful tips to do for our man. 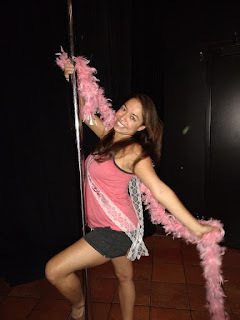 :) At the end of the class she showed us some upside down acrobatic pole tricks that had us all in shock at how good she was! I didn't realize how athletic strippers need to be. We could all take pictures at the end, just not during class for privacy of everyone. 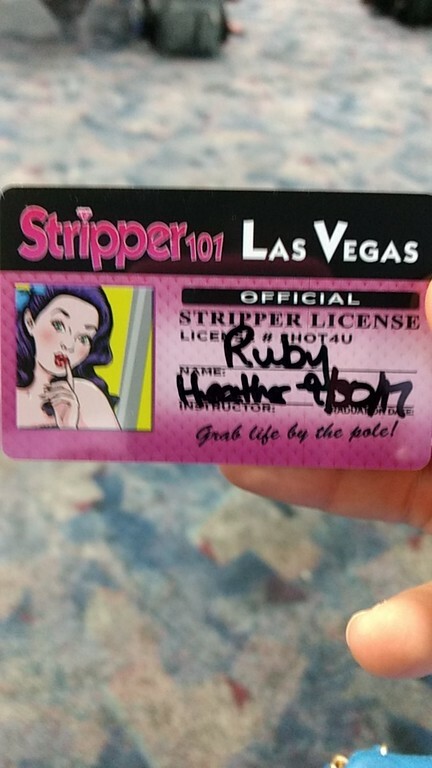 We even each got our own Stripper license. :) My stage name is Ruby, by the way. We could choose whatever stage name we wanted and if we needed help, there was a list to choose from. After the class we went back to the hotel to change for dinner, zip-lining and Chippendale's. Saturday was a packed day! 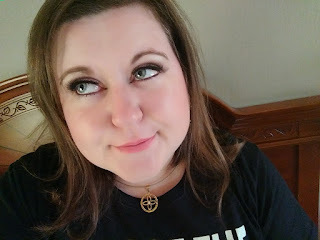 We got dressed (we wore the shirts my sister made) and I even wore false eyelashes for the first time ever!!!!! I really look like my mom in this picture. We decided to go to Downtown Vegas' Container Park area for dinner. Container Park is an area that is made up entirely of shipping containers as the buildings. It has restaurants and shops that you can visit and even has a huge playground for the kiddos. We all went down the slides at the park after dinner. 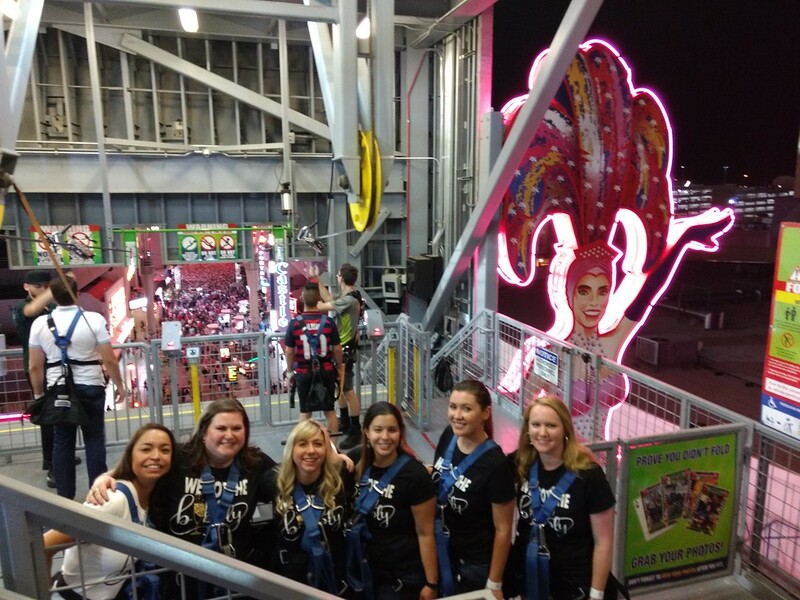 It is only about a 3-5 minute walk from Container Park to the entrance to Downtown Vegas' Freemont Street. The zipline we did was called, Slotzilla. You can go during the day or the evening, but we chose the evening to zip past all the lights that are blinking everywhere! 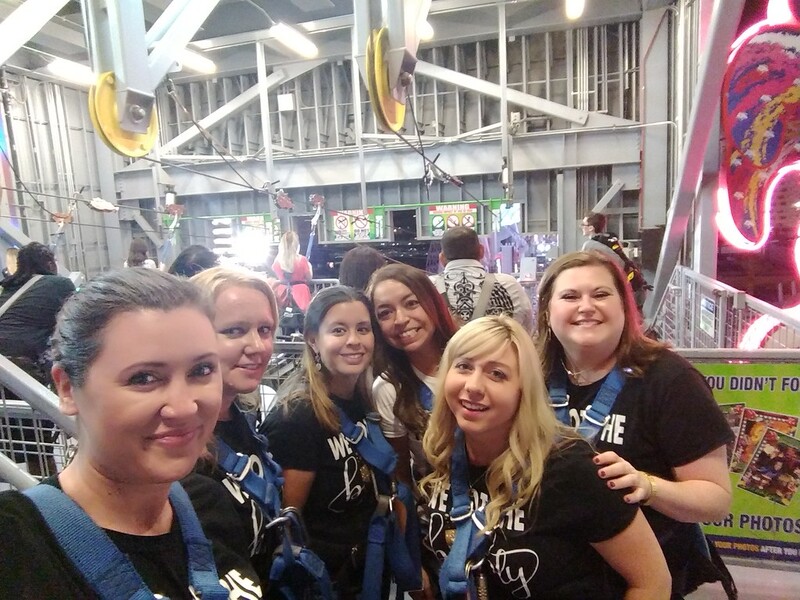 We got our ziplining wristbands and went up the steps at our designated time. 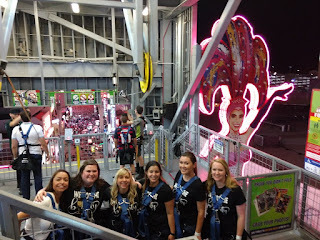 We got fitted for harnesses and walked a zillion stairs to the platform. There was a huge crowd there and it turns out it was for a Chevelle concert. I didn't know who they were, but apparently they were a big deal. They hooked us up to the wire and had us walk down some stairs and sit back into the harness. They said, "Have fun" and let us go. We made it to the concert and the crowd cheered for us as we zipped by. So cool. 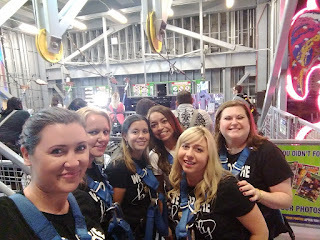 Only 6 of us (out of 7) did the zipline, the 7th person took pictures (she's afraid of heights). After ziplining we had to book it to the Rio for the Chippendale's performance. We made it on time and were seated in the back (the balcony-which isn't really a balcony, it's just the back row). We had free tickets so we couldn't really complain where we were seated. The seats were still good and we could see everything. I think we were loud enough and clapping a lot so we got moved up to the front of the room to some vacant seats!!! Amber got to go onstage (not saying what she did *wink) and we all cheered for her. I love Chippendale's because it was more of a show vs just strippers. I mean, I feel so dirty holding dollar bills making them work for it. Having tickets and dance routines classed it up a little bit. 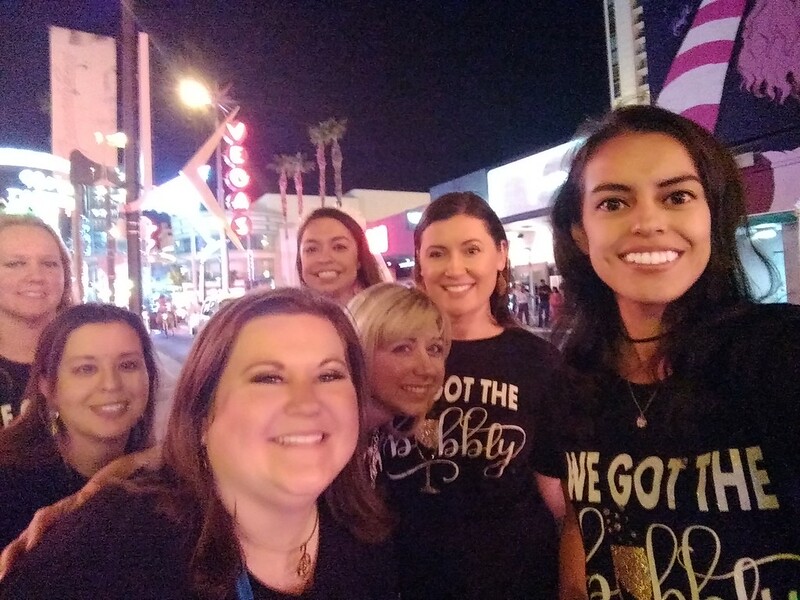 At the end they told us to take a selfie and post it with #Chippendales and one of us would be chosen as the winner. Can anyone guess who was the winner....ME!!!!! I won a poster, a blinky light up necklace thing, a compact (I think, I haven't opened it yet), and lanyard. I gave the poster back to the gift shop because, honestly, what am I going to do with a Chippendale's poster? Calendar, maybe, but not a poster. Sorry guys. We wanted to take the shuttle to the Flamingo from the Rio but the shuttle driver was rude so we took a Lyft. They had given us a $10 play match (play $10 and get $10) so three of us played my $10 and agreed to split whatever we won. Clarissa suggested we play the $20 on "ODD" since there were an odd number of us. We doubled our $$ so we came out with $40. I took my original $10 back, we used $10 for the Lyft ride, and we split the other $20. Easy $30!! 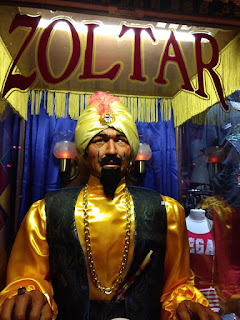 Ever since seeing that movie, Big, I wanted to get my fortune out of one of those Zoltar "fortune telling" machines. We saw one at The Rio on the same floor as Chippendale's and three of us got our "fortune". Mine was all about travel. Hmm. I love travel!! 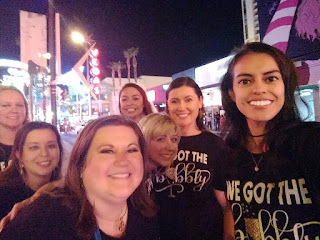 After the show we went back and did some other "what happens in Vegas, stays in Vegas" stuff. Sunday was spent cleaning up all the crepe paper, popping balloons, and eating the last of the jell-o shots. Four of them left at 9:30 AM and three of us stayed behind until our flights. I was the only one that was leaving that evening, the other two girls were staying an additional night. 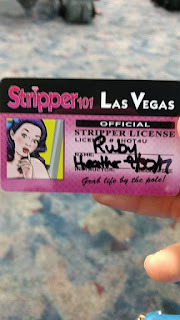 I just walked the strip and hung out the next day until my flight time. Before I left the Flamingo, I put $10 in a slot machine and I lost money down to $4 but I did it one more time and won $17 something. I tried one more time and lost down to $16.05 and then cashed out. I figured $6 in winnings was better than none. I knew I wanted to play Roulette so I found a table and played a few times. I won all the way up to $27 and used that money to have lunch at the Flamingo Hotel buffet (not worth it). My flight left at 7:55 PM and I got home right as the shootings (or just after) were happening. That is the closest I have ever been (or ever hope to be) to a terrorist event. The other girls in our group that stayed behind were in the hotel before the shootings happened and had no idea anything was happening until the next morning when they woke up to our texts. My favorite things are flamingos, tulips, glitter, and travelling this wide world we live in!